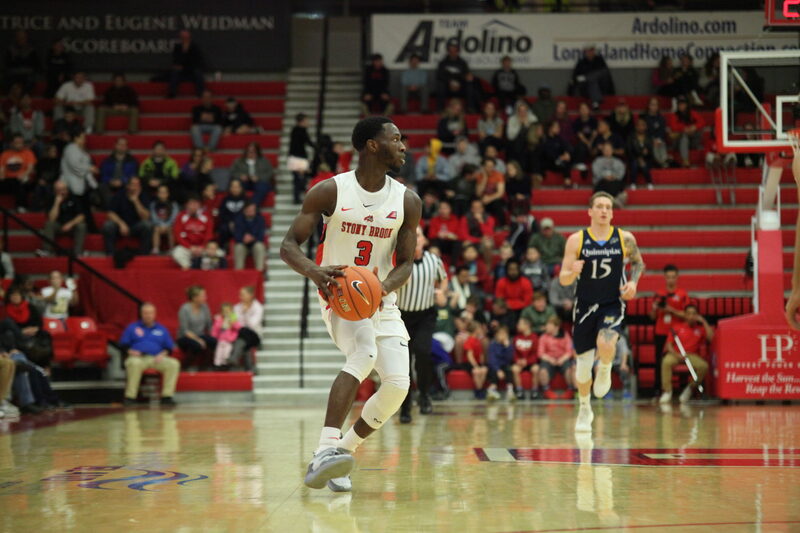 Stony Brook Men’s Basketball sophomore forward Elijah Olaniyi deservedly gleamed as he entered the postgame press conference, coming off an 86-77 victory over Hartford on Saturday, Feb. 2. “Man, I wish I had hit 30,” Olaniyi said as he read the stat sheet. Olaniyi’s commanding performance was the boost Stony Brook needed after dropping two straight games, against Vermont and UMBC, for the first time this season. A third loss would have knocked the Seawolves to fourth place in the America East standings midway through the season. The Seawolves entered Saturday night facing a challenging rapid-fire Hawks team which knocked down a program-record 19 shots from three in their prior game against Binghamton. Olaniyi jumpstarted the Seawolves offensively by earning the first seven points just three minutes into the first half. As Hartford tried battling back, Stony Brook continued turning to the guard as he torched the rival defense inside. When he was double-teamed, Olaniyi countered by splashing back-to-back shots from well behind three, roaring to the thundering sea of Stony Brook fans as he put them up 24-14, 12 minutes through the first. Stony Brook excelled defensively in the first half by holding Hartford below 28 percent shooting. The Hawks were far from replicating their impressive shooting on Wednesday and were held to 21 percent from three in the half. Meanwhile, Stony Brook shot over 50 percent in the half and took a 41-28 lead entering halftime. While Hartford struggled from the field in the first, it started the second half 4-5 and cut the deficit to single digits off a layup by senior forward George Blagojevic. In response, Otchere, Garcia, Cornish and Olaniyi dominated inside and gained a 23-point lead midway through the second half. Despite falling well behind, the Hawks remained resilient and capitalized off the Seawolves’ lackadaisical defensive showing late in the half. Blagojevic cut the deficit to 10 coming off the media timeout before senior guard J.R. Lynch dropped in layups, making Stony Brook’s lead 74-68 with two and a half minutes remaining. However, Yeboah and Olaniyi held off the comeback with free throws and iced the game. Stony Brook’s 86 points is the most scored this season and the highest since the 86-75 on Jan. 16, 2017. Both Yeboah and Garcia finished with a double-double, earning 16 points and 14 rebounds and 13 points and 11 rebounds, respectively. Hartford senior guard Jason Dunne led the Hawks with 19 points. The Seawolves improve to 18-5 overall and 6-2 in the America East, good enough for second place alongside UMBC. Their next game will be on Wednesday, Feb. 6 against Binghamton, a team which leads the conference with 117 overall blocks. Tipoff is scheduled for 7 p.m.